From the moment you step through the wooden and glass doors you’ve entered a world of luxury and indulgence unto itself. An intimate jewel box of a restaurant with just three tables in the heart of downtown Lockhart, Restaurant Jezebel offers the best in bespoke dining with chef Parind Vora to prepare a unique and excitingly creative menu for your table. 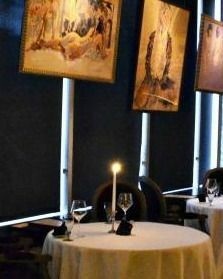 At Restaurant Jezebel you discuss your preferences and dietary needs directly with the renowned chef and he prepares the plates that are unique to the table’s palette. Your plate is a playground for exotic game and the freshest seafood and even the most stalwart of classics is prepared with an unexpected sense of wit and flair for the dramatic. Every experience you have at Restaurant Jezebel will be unique and exciting, truly, a night of memories. Wine is available as 5-course wine pairings that will match your food. There are two levels of wine pairings available. Restaurant Jezebel proudly offers a mid-tier ($75 per person) or the top-tier ($125 per person). Both tiers offer amazing wines for the money as wines like Merry Edwards Sauvignon blanc and Bodegas Contador, Benjamin Romeo ‘Predicador’ Rioja are examples of wine poured at our mid-tier wine pairing and Aubert chardonnay and Sea smoke 'ten', or maybe an older Sassicaia or a Araujo are examples of wines poured in our top-tier pairings. Wines from the inimitable grand cru vineyards of Domaine de la Romanée-Conti are available (as always) only by the bottle but please indicate it in your reservations request and we will work with you to have the vineyard, vintage and decanting needs according to your wishes ready for your arrival. Our wine pairings use only top shelf wine to match the level of the food. Featuring sparkling, white, reds & rosés. The Jezebel experience is one that that you will savor forever. It is ‘couture dining…never off the rack’.